An interactive digital wall responds to subtle body movements in real-time, emphasizing the firm’s digital experience capabilities. Photo © Eric Laignel. 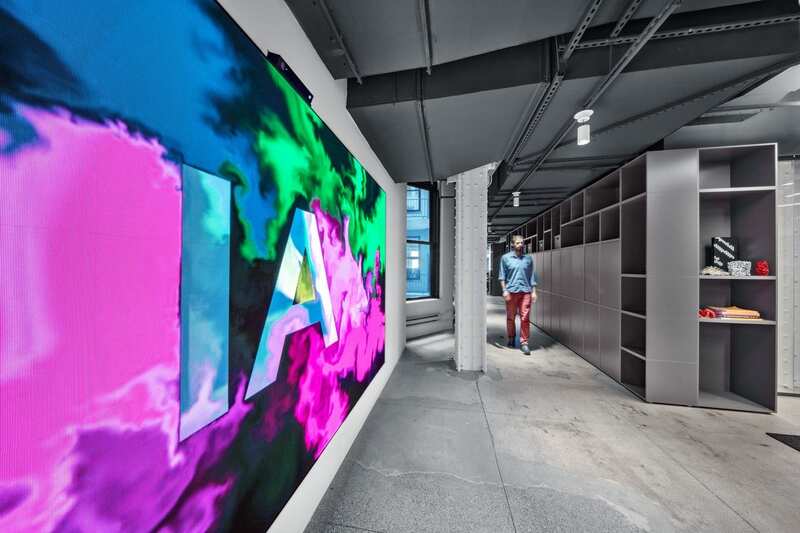 In a move driven by growth, IA’s New York office has relocated to 100 Broadway, a landmark skyscraper dating back to 1894, in the heart of the city’s financial district. The design of the new workspace takes full advantage of the site’s original neoclassical architecture by exposing original elements, including remnants of the original mosaic tile floor. But the overall look and feel of the new space is unmistakably contemporary and minimalist with an industrial feel, monotone palette, and open plan geared for flexibility and creativity. Metal mesh walls, a custom reception desk of stacked and angled plywood and conference rooms that convert from two to one or open to a larger flexible area are a few of the features. Conference rooms convert from two to one or open to a larger flexible area. Photography © Eric Laignel. Design elements connect the new space to its financial district neighborhood. Since the new location marks the halfway point on the New York ticker-tape parade route, the graphic band on conference room glass walls is a ticker tape with a hidden message referencing IA’s core values. And all of the conference rooms are named after Alexander Hamilton and his family, who rest in peace across the street in the graveyard at Trinity Church. 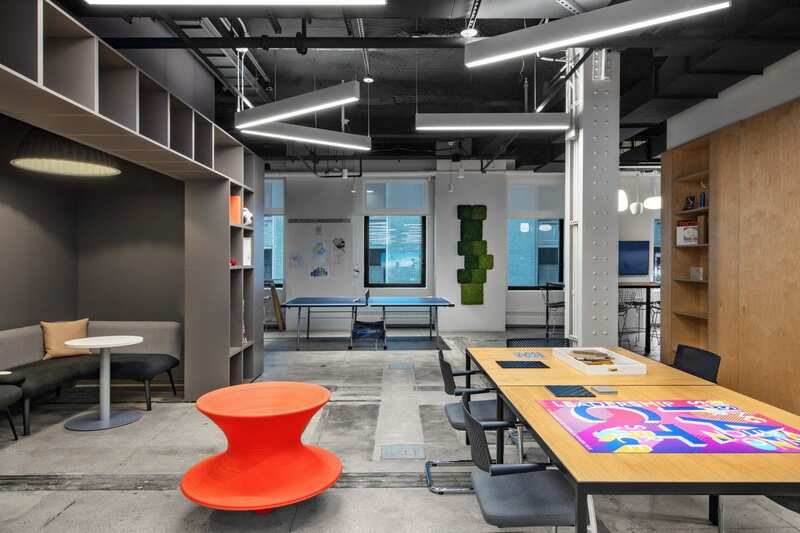 Overall, the design intent is to create a neutral backdrop for the inspired work of the design team, a creative lab for experimentation and the generation of thought leadership and research, as well as a venue for client events. The space is planned to showcase how IA works internally, as well as with consultants and clients. Photography © Eric Laignel. The fully hackable studio lends itself easily to welcoming guests and to social events, providing multiple options and seating arrangements for creative interaction and solo work. Sit-stand desks, long work tables, writeable walls, and alcoves for conversation or respite are all part of the mix, as are conference rooms with state-of-the-art technology, phone rooms, a library with a light lab, and an eat-in pantry. 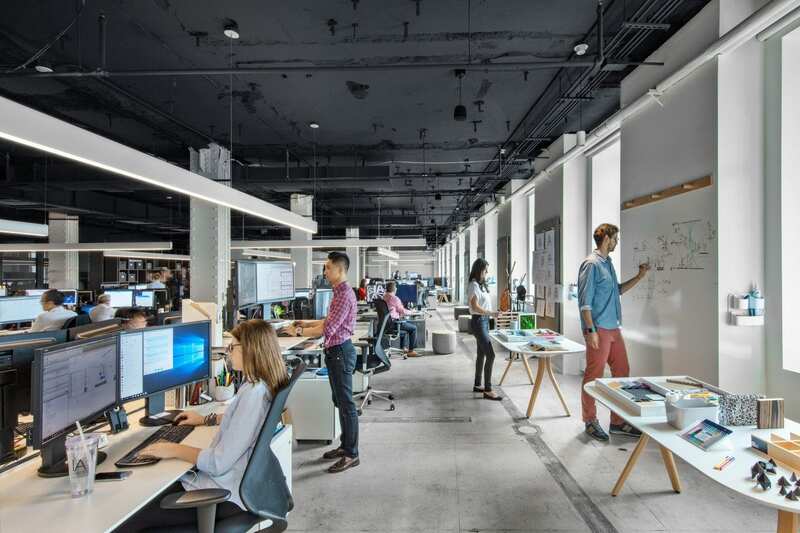 Since process, ideation, and collaboration are at the core of the business of design, the space is planned to showcase how IA works internally, as well as with consultants and clients, and supports both digital and analog forms of collaboration. The lobby, also hackable, has become a valuable collaboration area which engages all visitors. Designed to be flexible in size and layout, the space is also used for film screenings, industry events, client-only events, mockups, workshops, new product demonstrations, pop-up exhibits, and other purposes. Here, an interactive digital wall readily tracks and responds to subtle body movements in real-time, creating a unique, engaging feature, and showcasing the firm’s digital experience capabilities. 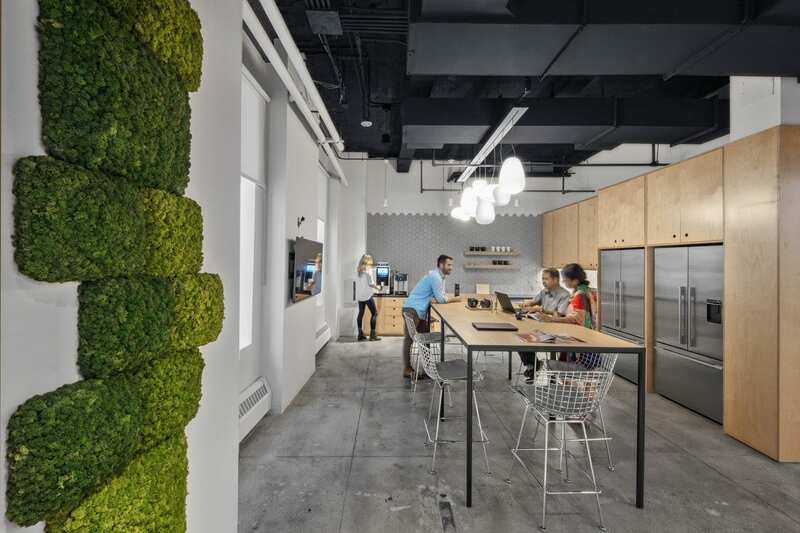 Sit-stand desks, long work tables, writeable walls, and alcoves for conversation or respite are all part of the mix. Photography © Eric Laignel. The new office is designed for a variety of work styles and offers a choice of workplaces and amenities. Photography © Eric Laignel. The relocation to the financial district also gives staff greater access to outside amenities, allowing for conscientious breaks throughout the day. And it supports the workflow, ideation, and research that define the IA team while encouraging wellness and comradery.